All-species fitness: Monarchs, again - they need your help! Monarchs’ navigating skills allow these members of an otherwise tropical butterfly family to 1) reach and exploit the huge supply of new plant growth in the temperate parts of North America each summer and 2) then fly south to avoid the winter cold. This arrangement has boosted monarch fitness immensely – generations of people across Mexico, the U.S., and Canada have enjoyed their spring and fall arrivals. Yet this multi-million member march across North America is threatened by ever-expanding human development in California, Mexico, and sites all along the monarchs’ migration routes. 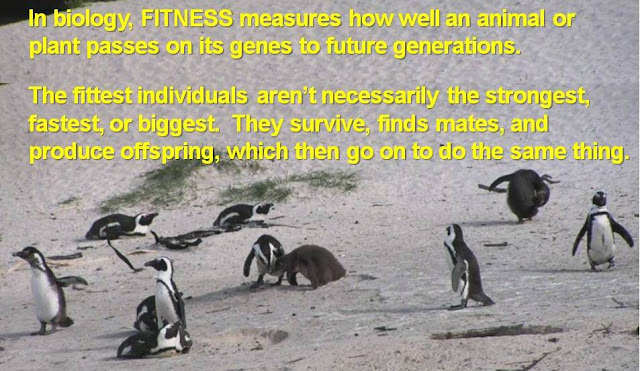 And the march is the key to this species’ biological fitness and survival. The IMAX film, Flight of the Butterflies, shown in this promo, looks amazing, and this web site lists where you can watch the full big-screen drama. 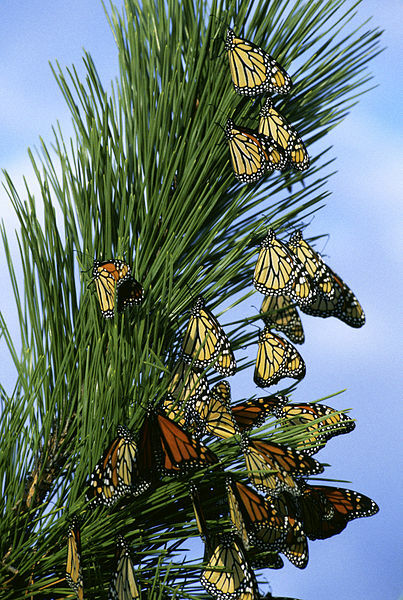 At the moment, monarchs as a species are not threatened, and smaller populations of these butterflies breed in Mexico, California, and the southern U.S. states. But their remarkable north-south migration, considered an endangered biological phenomenon, is. Migrating monarchs face natural dangers, including storms and predators, which are often other insects. But according to Chip Taylor, who runs the Monarch Watch Program at the University of Kansas, their biggest threat is habitat loss. 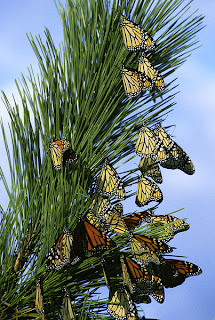 Like all living things, monarchs need food, water and shelter to live. 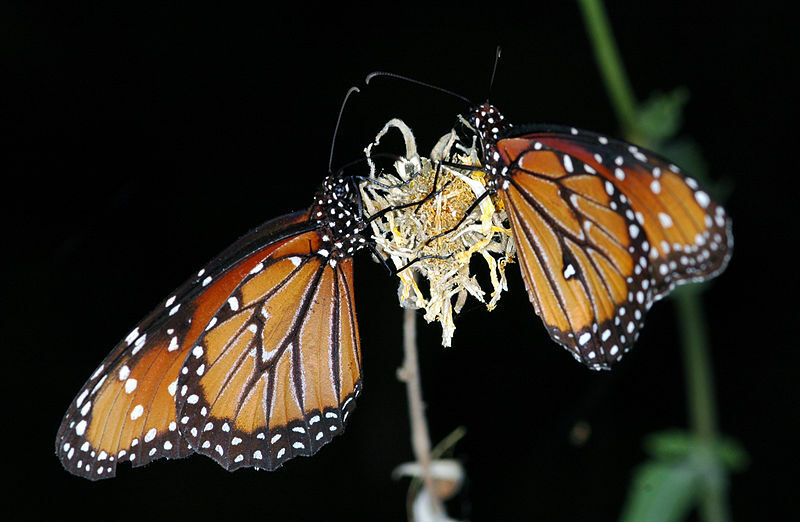 Adult monarchs eat nectar from flowers, and their larvae (the caterpillar stage) eat milkweed plants. Each of these critical resources is facing big threats from human activity, and the monarch population has recently shown signs of declining rapidly. Logging of the forests in Mexico that are the monarchs’ winter homes removes potential butterfly roost trees and opens up the canopy, letting rain and cold into the previously sheltered understory. Roughly 1/5 of the forest used by wintering monarchs has been lost or disturbed, despite government decrees to improve its protection. Despite their ability to migrate long distances, monarchs are fragile. They survive on their fat reserves, if you can believe that, given their small size. Exposure to rain plus freezing temperatures can kill millions at once, so they must avoid getting wet and cold at the same time. Monarchs are cold-blooded so can move only in warm enough weather. In their winter homes in Mexican forests, they are fairly inactive and huddle together while they await spring and the regrowth of the milkweed and other flowering plants that they and their offspring need to live. Because the wintertime monarchs are huddled so tightly, they are impossible to count individually, so scientists monitoring their numbers measure the butterflies by the area they cover while roosting. This area fluctuates annually but has over time decreased from roughly 50 acres (20 hectares) in the 1990s to 7 acres in 2011 and just 3 acres this past December. 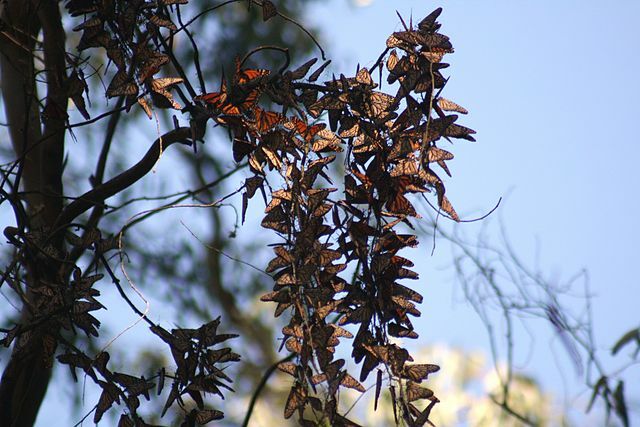 The huge clusters of overwintering monarchs stay within a small area and have become a major tourist attraction, but lumbering is still more lucrative and encourages some local residents to cut trees. The declining populations also reflect the changing landscape and agricultural practices at their summer homes and all along their migration routes in the U.S. and Canada. About 6,000 acres of land are paved over each day for roads and buildings, leaving less space each year for butterfly habitats. Milkweed is considered a noxious weed by some farmers, who destroy the plants, most commonly using herbicide. The poisons of course also kill the butterflies that eat the milkweed (all monarch caterpillars, as well as other species). Genetically-modified ("Roundup-ready") corn and soy that dominate the landscape of the Midwest resist strong herbicides like Roundup. The increasing use of these chemicals kills milkweed and other native plants but not the corn and soy. The result? Oceans of corn and soy, but far less food for native insects like monarchs. According to Lincoln Brower, a monarch expert at University of Florida/Sweet Briar College, 63% of the milkweed plants in the U.S. Midwest have been killed over the past decade. 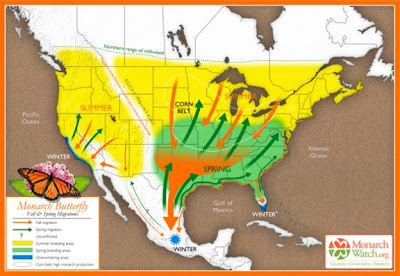 Chip Taylor, who runs the Monarch Watch Program at the University of Kansas, believes that the future of the monarch’s unique migration will depend on efforts by people across the monarch migration routes. He fears that, "Without an effort to protect monarch habitats and restore milkweeds, this incredible migration will slowly fade away". 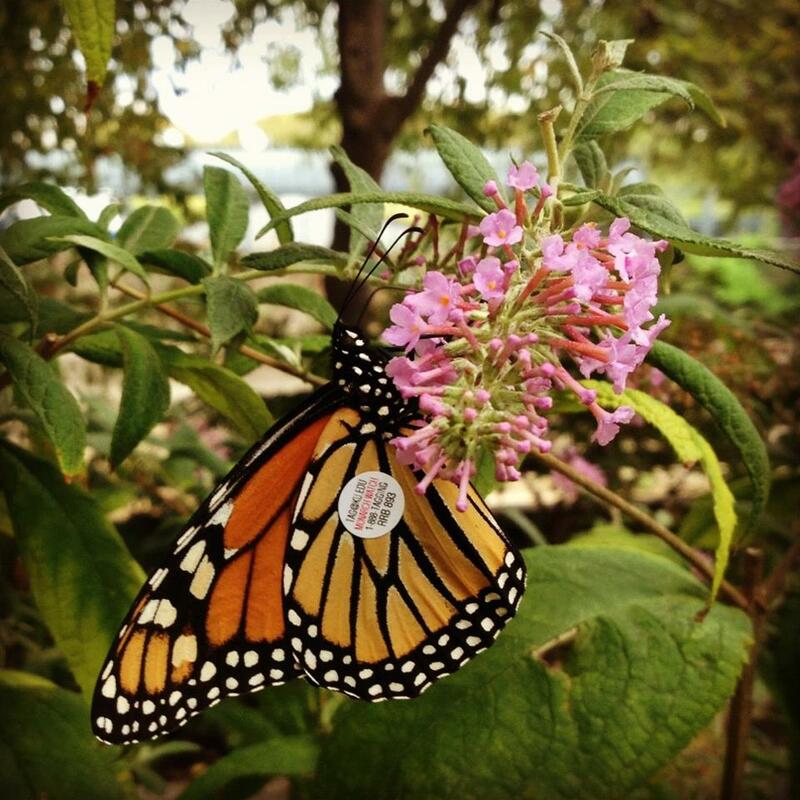 Monarch Watch encourages gardeners, schools, governments and businesses to plant monarch "way stations" – basically small gardens consisting of milkweeds and other butterfly plants -- in hopes that the dedicated habitats will sustain a threatened population during its migration. Here’s why and how to set up a way station to support the monarchs as they journey north and south each year. Or, to make your garden monarch-friendly, plant some of the many varieties of colorful flowers with nectar enjoyed by the monarchs, such as asters, azalea, daisy, lilac, primrose, or zinnia, and, of course milkweeds for the caterpillars. You’ll get not only the flower blooms but also the chance to watch monarchs and other butterflies flying, feeding, competing for mates, and basking in the sun. Contribute even more directly to monarch survival by raising monarch caterpillars to butterflies and releasing them as adults. Monarch Watch provides monarch caterpillars to hundreds of schools, and the group’s web site explains the butterfly’s development and shows you how to raise and then tag butterflies so that citizen scientists who find them will be able to record their starting location. Every tag found helps researchers learn more about the migration, and as the previous posts show, there is still much to discover. Encourage laws that conserve summer monarch habitat, in the form of natural pesticide-free meadows, and winter habitat. The Arkive monarch photo show provides not just great photos but also information on the biology, range, habitat, status, threats, and conservation of monarchs. An interview with Chip Taylor, found of Monarch Watch, about the current monarch population status threats to monarchs, and some of the ways people are trying to protect them. An interview with Lincoln Brower on the monarchs' status and some of the activities that threaten it, cool facts about their migration, and their ability to find milkweed anywhere. This helpful summary of the status of the monarch population at Monarch Watch, a source for loads of information on these butterflies. Have a look at the Xerces Society monarch page for information on the less-studied, but also impressive Western monarch population and migration.